B.C. 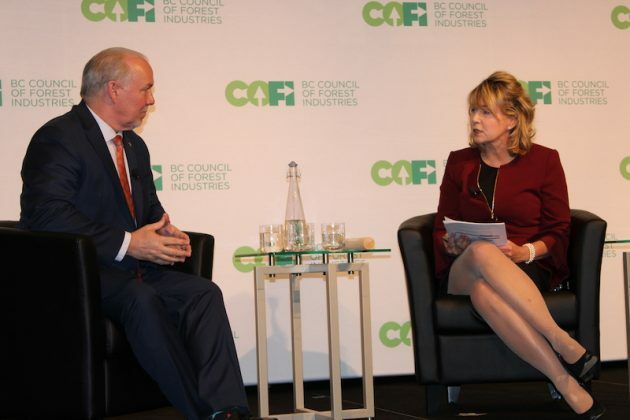 Premier John Horgan talks with COFI President and CEO Susan Yurkovich. “Forestry is at the heart” of the B.C. 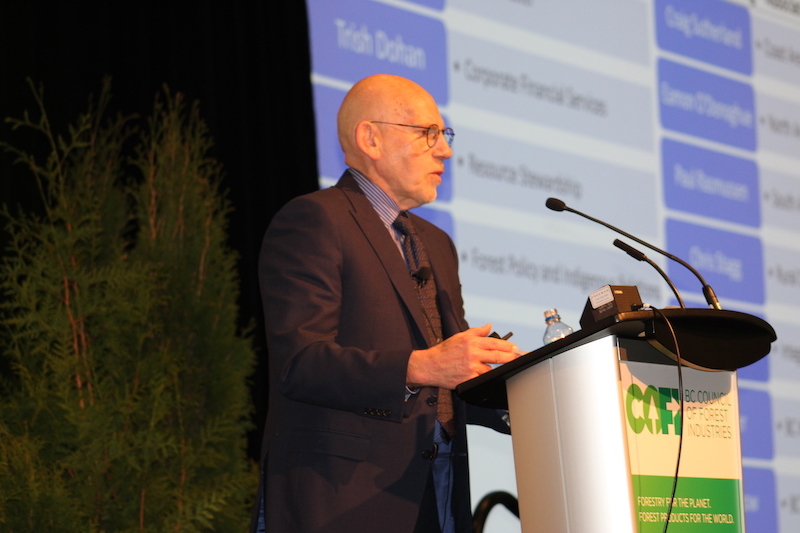 economy, Jock Finlayson, executive vice-president and chief policy officer for the Business Council of B.C., told 675 attendees at the B.C. 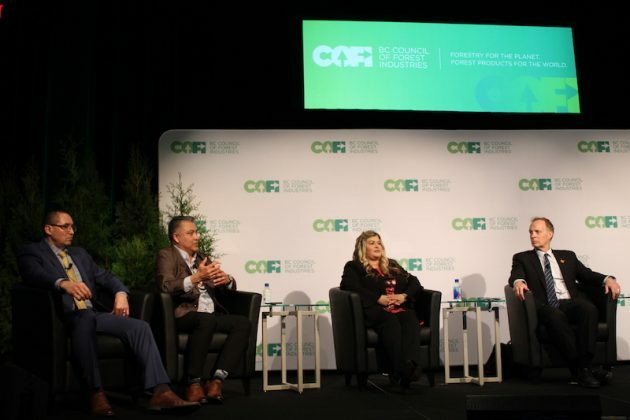 Council of Forest Industries (COFI)’s annual convention in Vancouver from April 3-5 at the JW Marriott Parq Vancouver Hotel and Conference Centre. Following a recent economic study by COFI, which found that the B.C. 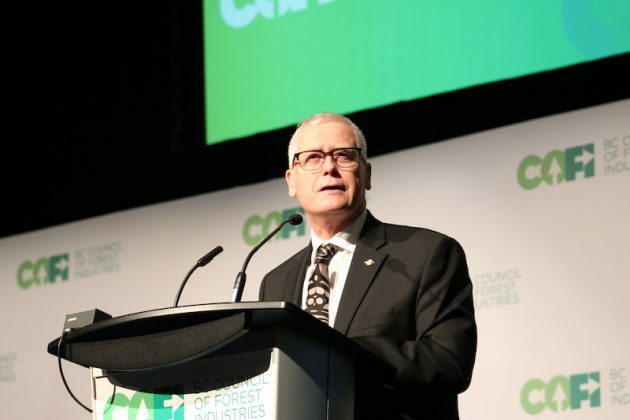 forest sector employs 140,000 jobs across the province, it’s no surprise that speakers at the convention emphasized the need for greater co-operation between industry, government and First Nations, and shared concerns about the current geopolitical pressures impacting the sector. Following opening remarks from COFI president and CEO Susan Yurkovich, who touched upon the strength of B.C.’s forestry industry despite numerous challenges, Doug Donaldson, B.C. 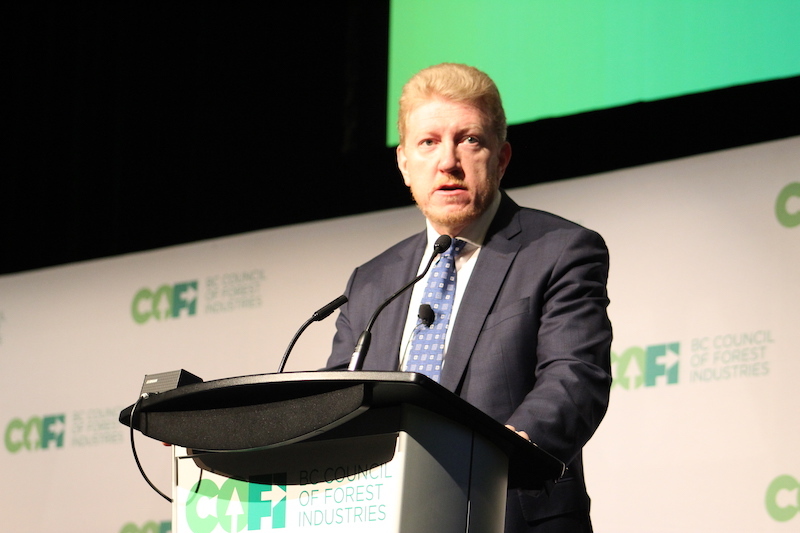 Minister of Forests, Lands, Natural Resource Operations and Rural Development, announced a $7.9 million investment to 15 trade associations to advance new wood products and markets. Minister Donaldson also reported on amendments to the province’s Forest Range Practices Act, which were brought to the legislature earlier that week. “The intention is to ensure the public is well-informed, leading to more support for the forest sector,” he explained. More support for the forest sector was a common theme throughout the three-day conference. During a discussion with deputies, John Allan, Deputy Minister for the Ministry of Forest, Lands, Natural Resources Operations and Rural Development, outlined the work the ministry has done in the past year, including implementing the Coast Forest Sector Revitalization Initiative. So far, the ministry has changed BC Timber Sales’ management structure and established fibre recovery zones. 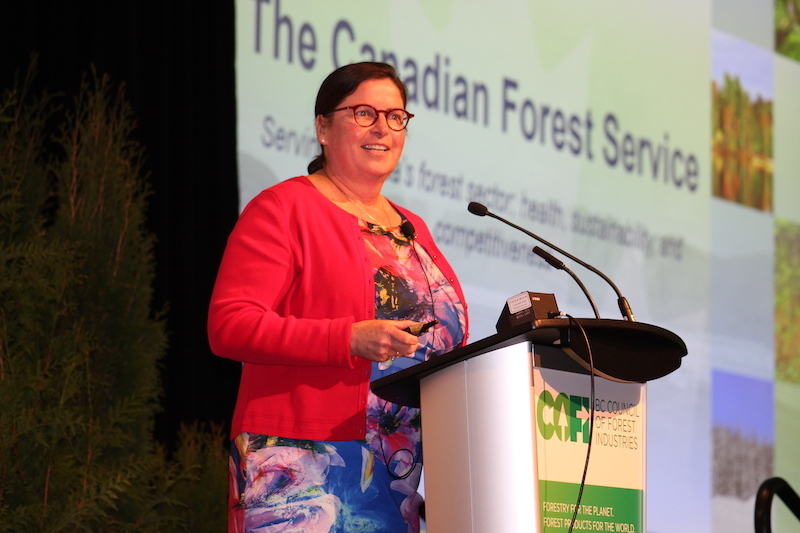 Beth MacNeil, Assistant Deputy Minister for the Canadian Forest Service, also emphasized co-operation between industry and government. 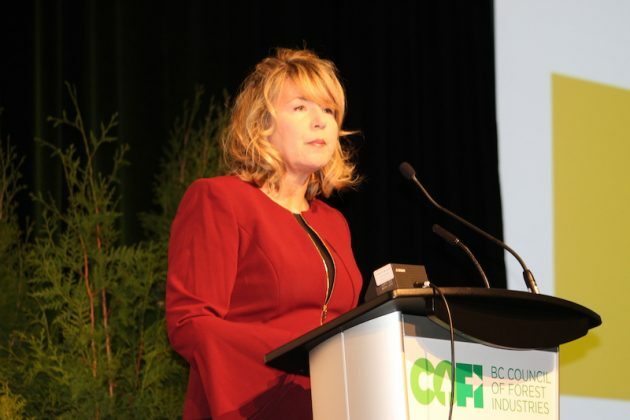 Under Budget 2019, the federal government has committed $251 million to forest programming over the next three years, and one-third of this funding is going to B.C., she said. 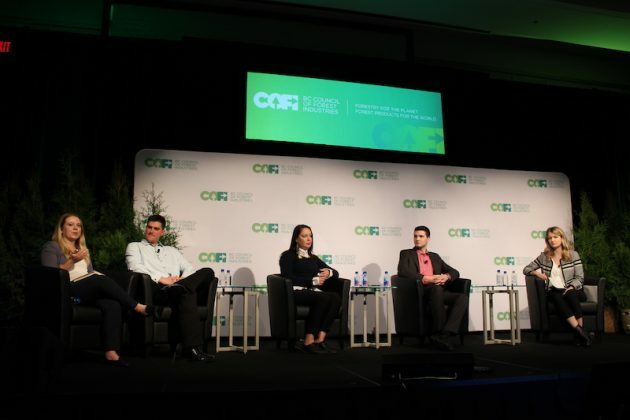 Much of this investment will go to exploring value-added wood products, such as bioproducts. During his keynote address, B.C. Premier John Horgan re-affirmed the provincial government’s commitment to the forest sector, announcing a new initiative to address the issue of competitiveness in the B.C. Interior. The government will facilitate conversations among leaders, including local chiefs, mayors, and CEOs in an effort to determine what the issues are and how to solve them. These discussions will take place “TSA by TSA,” with the aim of finding ways to create more value from a dwindling fibre basket. 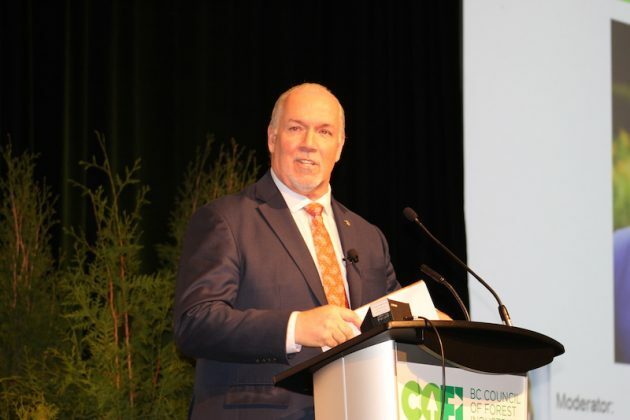 “The process is evolving, not prescriptive,” Premier Horgan emphasized. 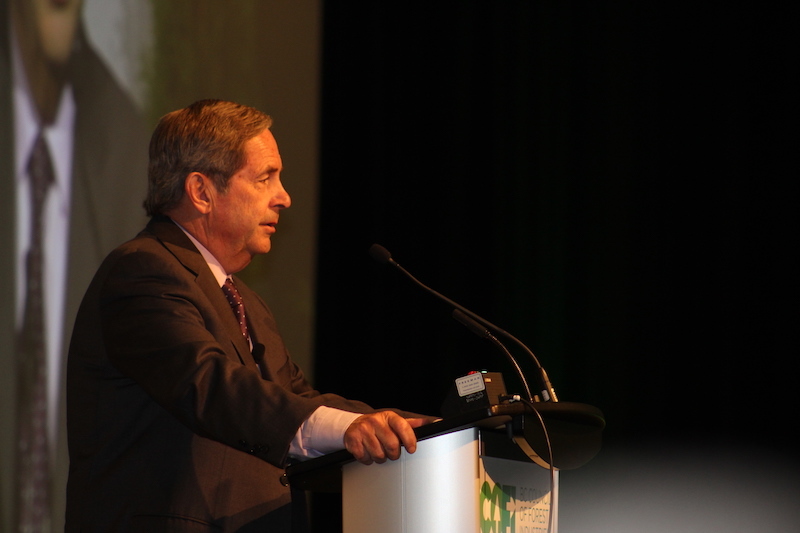 “It is absolutely vital if we’re going to continue to have a vibrant forest industry that we work together,” he said. Premier Horgan also announced that the British Columbia Museum in Victoria and St Paul’s hospital in Vancouver will be rebuilt using cross-laminated timber (CLT), re-affirming the government’s commitment to mass timber following its recent decision to allow 12-storey-tall wood buildings. Other speakers were also very optimistic about the opportunities mass timber and value-added projects present. Bart Bender, Interfor’s senior vice-president of sales and marketing, presented an update on the mass timber market during the markets update panel. Non-residential mass timber will give the industry access to significant market shares currently occupied by steel and concrete, he said. Since 2013, the number of mass timber projects built or in design in North America has risen from five to 487, he added. As an environmentally friendly alternative building product, with 11 facilities currently producing mass timber and another five recently announced, the future looks bright for mass timber. 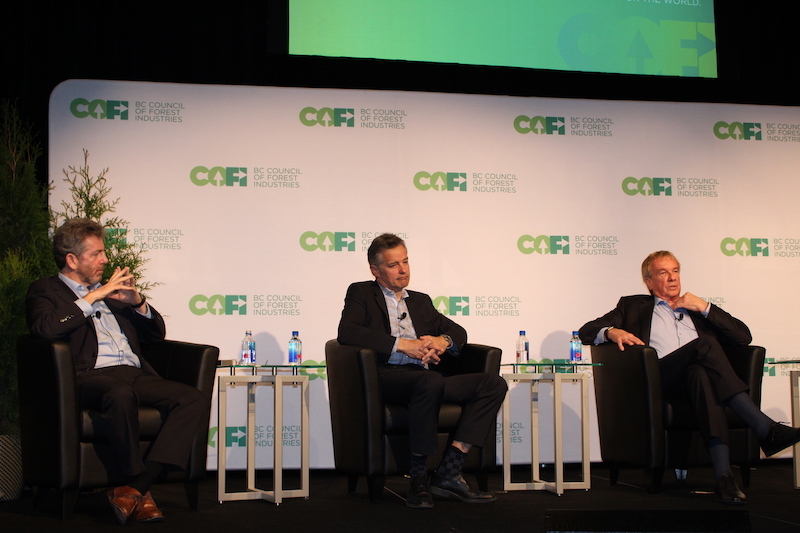 “It’s a great time to be in the lumber business and the forest products business,” Don Demens, president and CEO of Western Forest Products (WFP), told the crowd during the CEO panel. During this panel discussion, the CEOs fielded questions on topics including the impending caribou regulation, partnerships with First Nations and recent production downtime at sawmills. When asked about the downtime, Ted Seraphim, president and CEO of West Fraser, explained that shifts were reduced because of the mountain pine beetle’s impact on capacity. 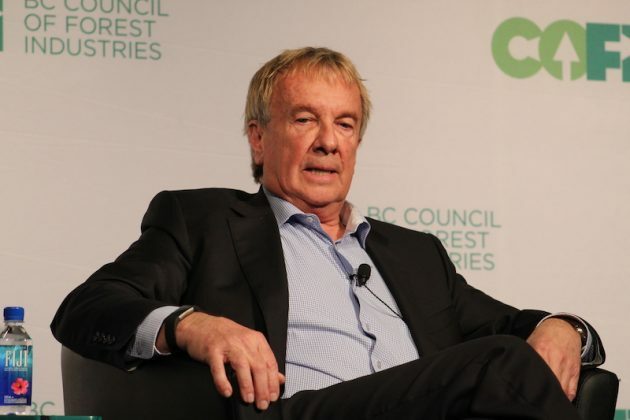 The company has invested almost $600 million to modernize its mills in B.C., to get more value out of the wood, but predicts more capacity will still come out of the forests. 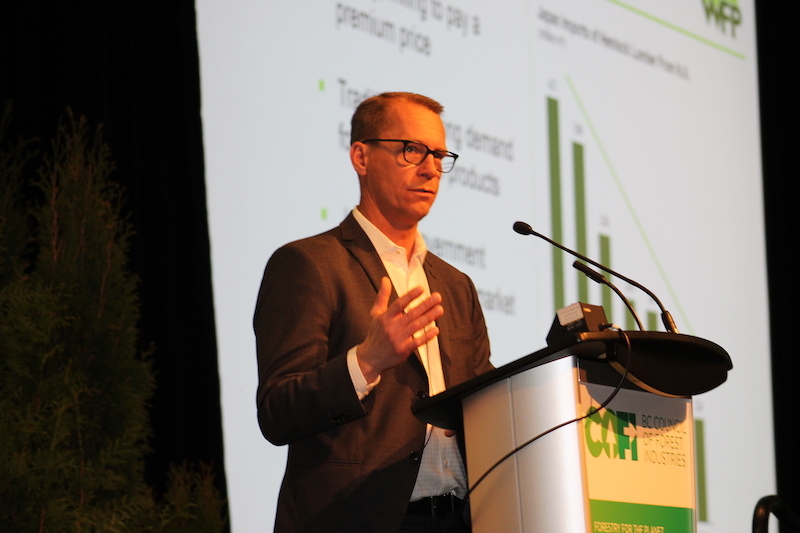 Don Kayne, president and CEO of Canfor, agreed, adding that the beetle will eventually run its course, but until then, Canfor is looking at opportunities to get more value-added products. For WFP on the B.C. Coast, the picture is a little different. 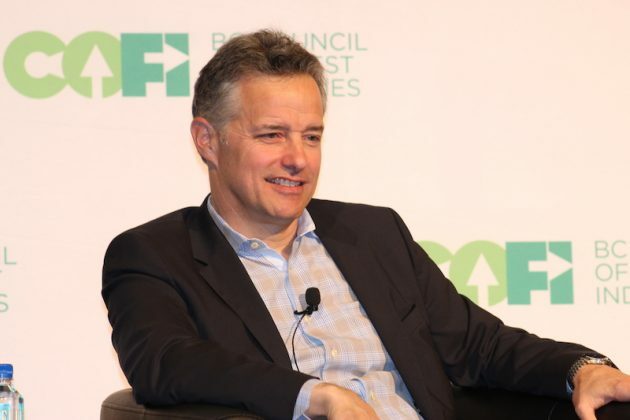 WFP reduced shifts to “ensure we can still be competitive on a global scale,” explained Demens. 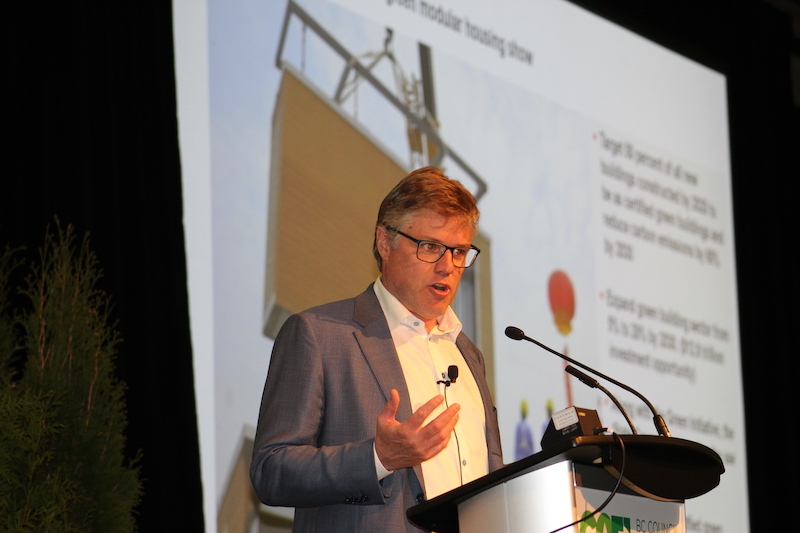 During the markets update panel, West Fraser’s vice-president of sales and marketing, Chris McIver, said that we will see continued growth in the consumption of lumber in North America, but B.C. will continue to shrink. The only area that will see growth on the supply side is the U.S. South. Consequently, in the mid- to long-term forecast, McIver predicts a shortage of lumber in North America. Therefore, export markets will be key, but markets like China and Japan are not as secure as they once were. 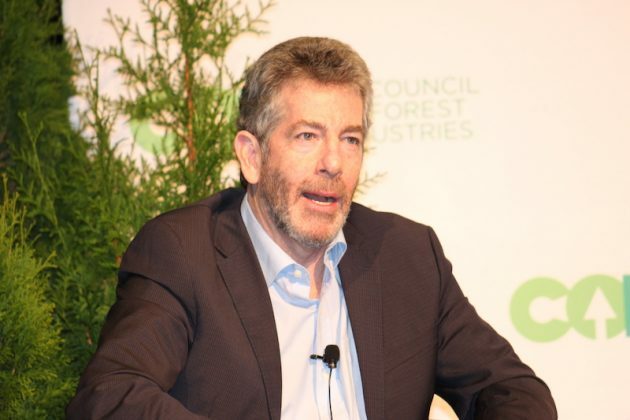 The Japanese government is now providing subsidies for their own forest products, which has led to increased competition, explained Don McGregor, WFP’s vice-president of sales and wholesale supply. As a result, Japanese imports of North American hemlock has decreased by 50 per cent. Yet Douglas Fir imports remains strong in Japan. 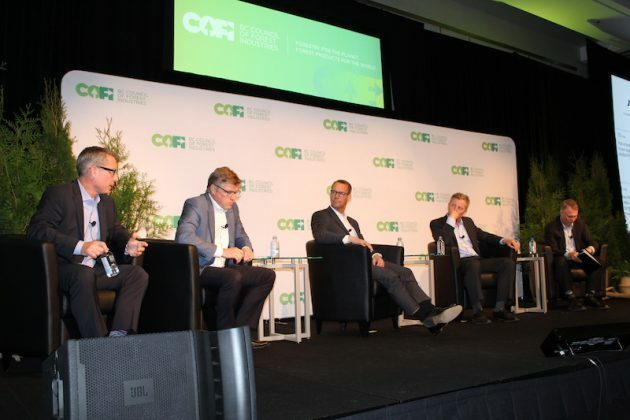 Kevin Pankratz, Canfor’s senior vice-president of sales and marketing, added that Japan will continue to be a key market because 57 per cent of the country’s care facilities are wood-based, and hotels – which are also wood-based – are expected to grow as the country experiences a boom in tourism. (From right to left): Derek Orr, business development manager, Carrier Lumber; Terry Teegee, regional chief, BC Assembly of First Nations; Celeste Haldane, chief commissioner, BC Treaty Commission; and Doug Caul, deputy minister, B.C. Ministry of Indigenous Relations and Reconciliation, speaking on a panel about reconciliation and the forest sector. Ted Seraphim, President and CEO, West Fraser. Don Demens, President and CEO, WFP. Don Kayne, President and CEO, Canfor. 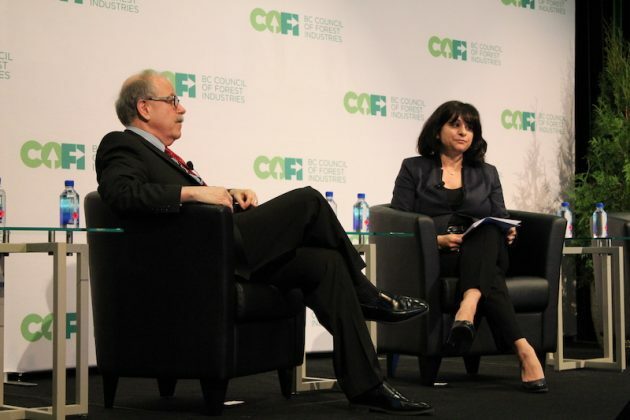 Susan Yurkovich, President and CEO, COFI. 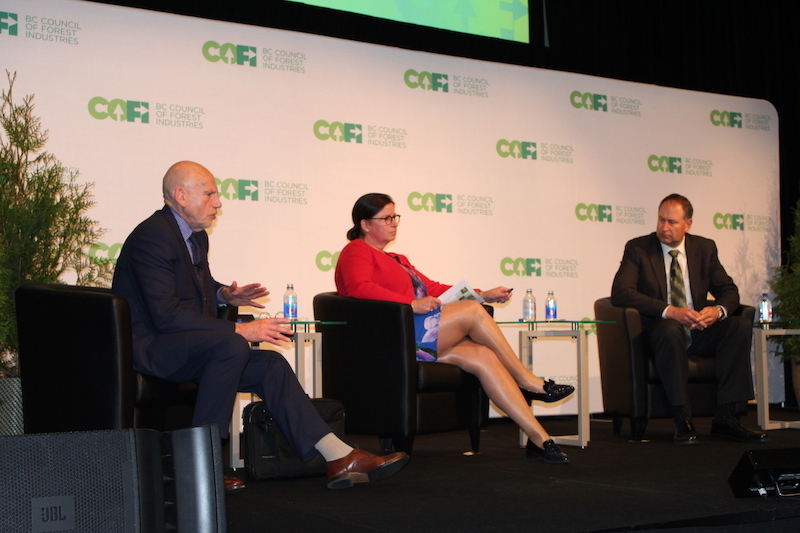 (From right to left): John Allan, Beth MacNeil and Mark Feldinger, senior vice-president, global supply chain, Canfor. John Allan, Deputy Minister, Ministry of Forests, Lands, Natural Resource Operations and Rural Development. Beth MacNeil, Assistant Deputy Minister, Canadian Forest Service. Ambassador of Canada to the U.S., David MacNaughton. Kevin Pankratz, senior vice-president, sales and marketing, Canfor. Don McGregor, vice-president of sales and wholesale supply, WFP. Chris McIver, vice-president, sales and marketing, West Fraser. Jock Finlayson, executive vice-president and Chief Policy Officer, Business Council of BC, and Mina Laudan, vice-president, COFI. B.C. Minister of Forests, Lands, Natural Resource Operations and Rural Development. Regardless of these opportunities, the industry is facing a lot of uncertainty. According to Robert Johnston, managing director of global energy and natural resources for the Eurasia Group, intensifying tensions between the U.S. and China is weakening the commodity outlook. The trade war between the U.S. and China will lower China’s growth rate. Consequently, India and Southeast Asia will become more important markets for Canada’s natural resources sector, Johnston said. 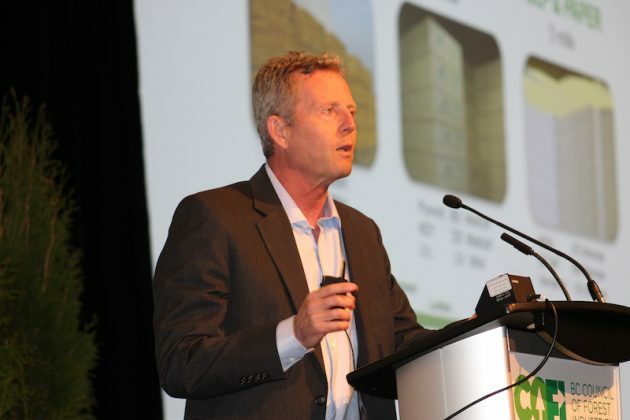 However, the ongoing softwood lumber dispute presents further challenges for the province and country, opening the door for increased competition and alternative pricing. In his keynote address, Canada’s ambassador to the U.S., David MacNaughton, spoke extensively on the dispute, explaining that while they were unable to reach a negotiated settlement as of yet, he is confident that the courts will rule in Canada’s favour. Brithis Columbia Forest Industry the biggest scammers on the planet cheat their sales force and their word is no good dont do business with these gangsters and thugs.